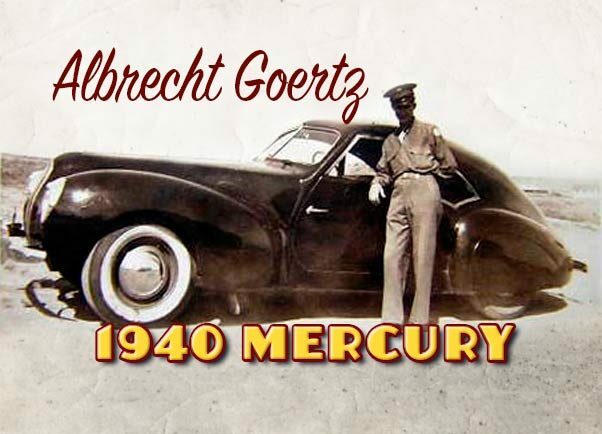 Albrecht Goertz of Los Angeles, California designed a European influenced 1940 Mercury based Coupe in late 1939. Later Albrecht would become world famous designing BMW cars. The 1940 Mercury during final construction in late 1939. Obvious in this photo are the hand made body, the use of modified Mercury front fenders and Lincoln rear fenders with factory flush skirts. Albrecht Graf von Goertz, was born on January 12, 1914, the second son to an aristocratic family in Germany. His parents were Else and Rudolf Graf von Schlitz gen. von Goertz und Freiherr von Wriesberg. Albrecht and his two siblings grew up on their parents’ estate near Brunkensen (Lower Saxony), about 40 kilometers south of Hanover. At the age of five, he discovered a passion for cars that would last all his life. Goertz began designing cars from his youth. 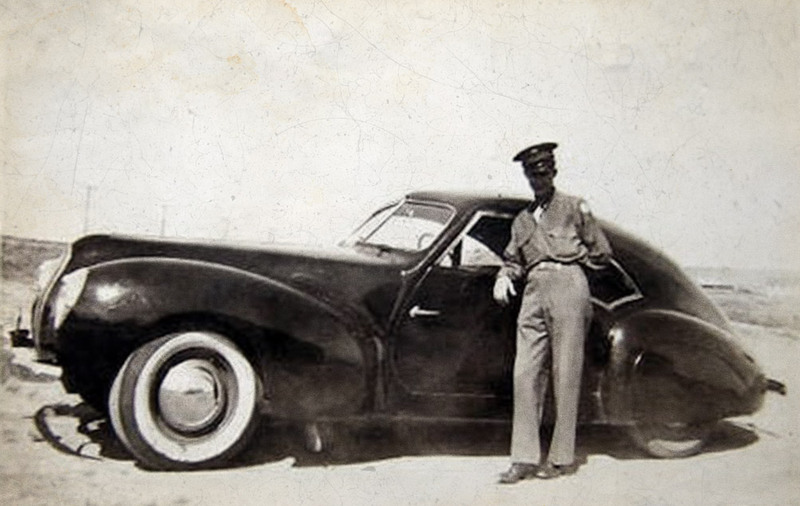 Francis Griffen, the builder of the car posing with the nearly completed car. The convertible in the back is an Auburn that was apparently owned by Gary Cooper, who wrecked it and the two bodyshop owners purchased it and repaired it. In 1934 he went to London and in 1935, Goertz applied to the American embassy at Grosvenor Square for an entry visa to the USA. In the autumn of 1936, he left Europe for New York City. A distant relative in New York helped him when he first arrived, but soon the young Count relocated to Los Angeles. To earn a living, Goertz worked at a car wash, in a factory for aircraft engines, and at a flight service. The car aficionado watched with great interest the emerging Hot Rod era and grasped the opportunity in 1938. 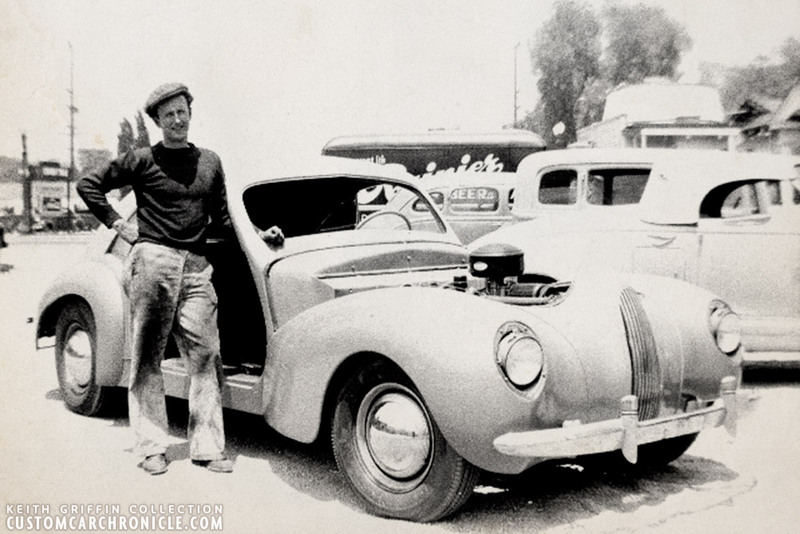 Goertz rented a garage and showroom located on Rodeo Drive and began to modify Ford Model A and B models. 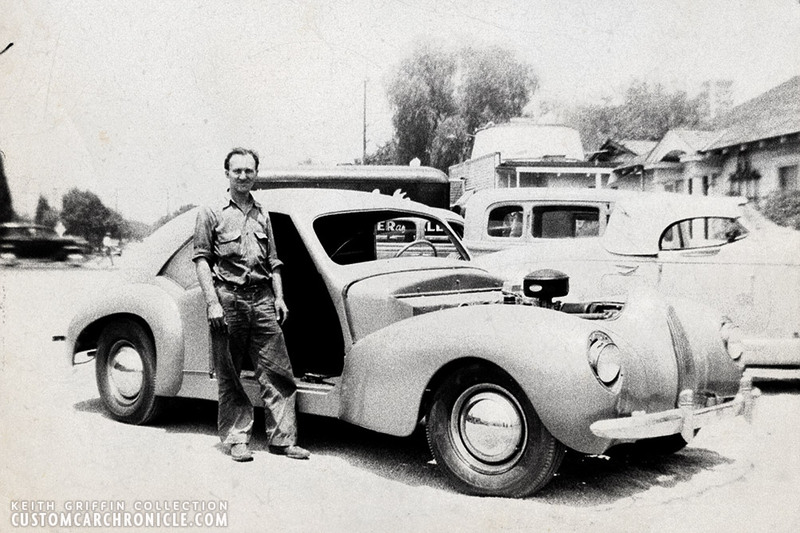 In 1939 he designed his first complete car on a Mercury chassis. the mostly new body for his car was done by Francis Griffen, who owned together with a co-worker, a very small body shop in Glendale, California. Goertz named his curvy two door coupe the “Paragon”. 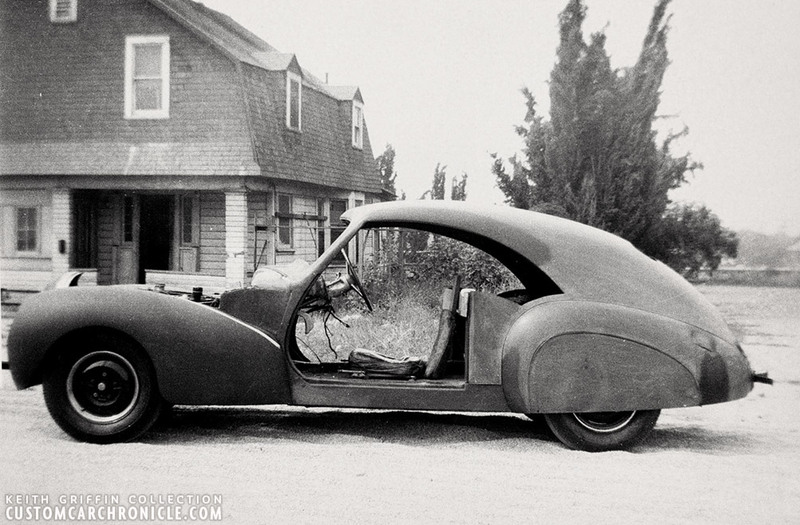 The car was exhibited at the 1939-40 San Francisco World’s Fair. Albrecht Goertz posing with the nearly finished Paragon. 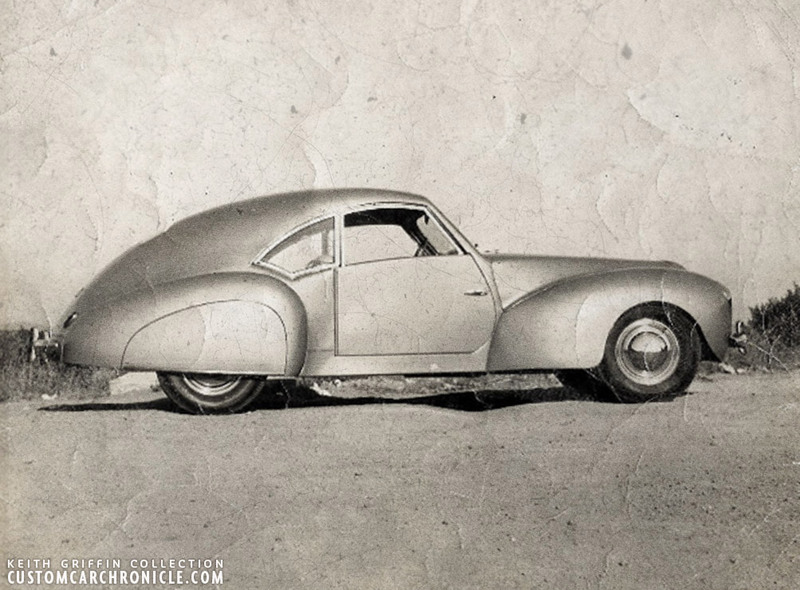 The finished Paragon Custom Car shows influences from European Coachbuilders with its flowing lines and curved dip on the belt-line. We do not know much about the body shop that was owned by Francis Griffen and a co-worker. And also not much on what was used on Goertz Custom Car. The only published information we have been able to find is that it was based on a Mercury frame. But how the body was constructed, if it was all hand made, or if body panels from other cars have been used, other than the Mercury front fenders and Lincoln rear fenders we do not know. Two small blurry images show the car in the early 1940’s. Front 3/4 view shows the beautiful falling down roof shape, the what appears to be Mercury windshield, rather flat body sides, and a very pointy hood. Beautiful styling. Later the car was repainted in a darker color, Here Albrecht Goertz poses with his car while in service. 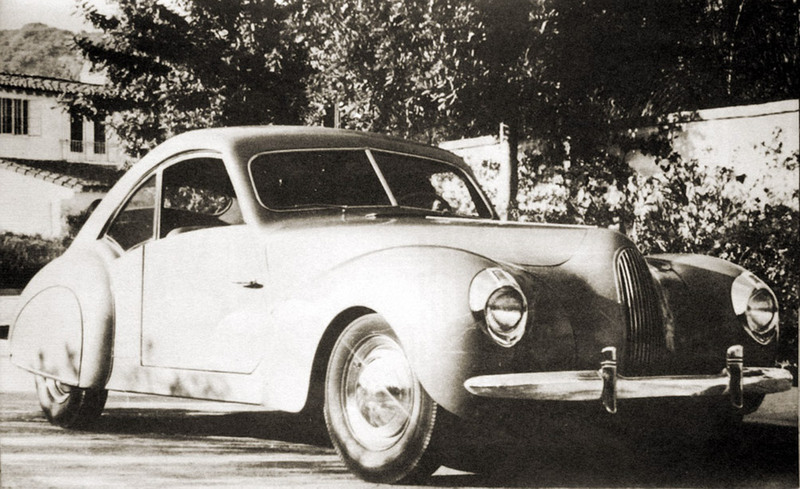 This photo appeared in the 1949 edition of the Dan Post Blue Book of Custom Restyling. It shows the set in license plate , the really small rear window and use of Teardrop taillights, most likely from ’38-39 Lincoln, but they could be Ford units as well. The license plate looks to be a California 1945 unit. The front of the car shows the 1940 Mercury headlights, reshaped fenders and bumpers The grille was as far as we can tell home made in a homemade surround. The Albrecht Goertz Mercury was used in all 1949 and up editions of the Dan Post Blue book, as well as in a few other early 1950’s publications. And that is also the last we have been able to find out about the car. We have no idea what ever happened to this unequally restyled Mercury. 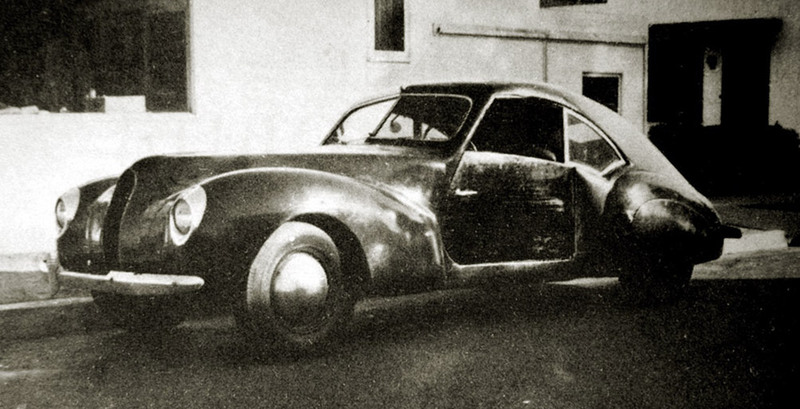 The car had both coachbuilt as well as Custom Car influences and helped boost the automotive design career of Albrecht Goertz. 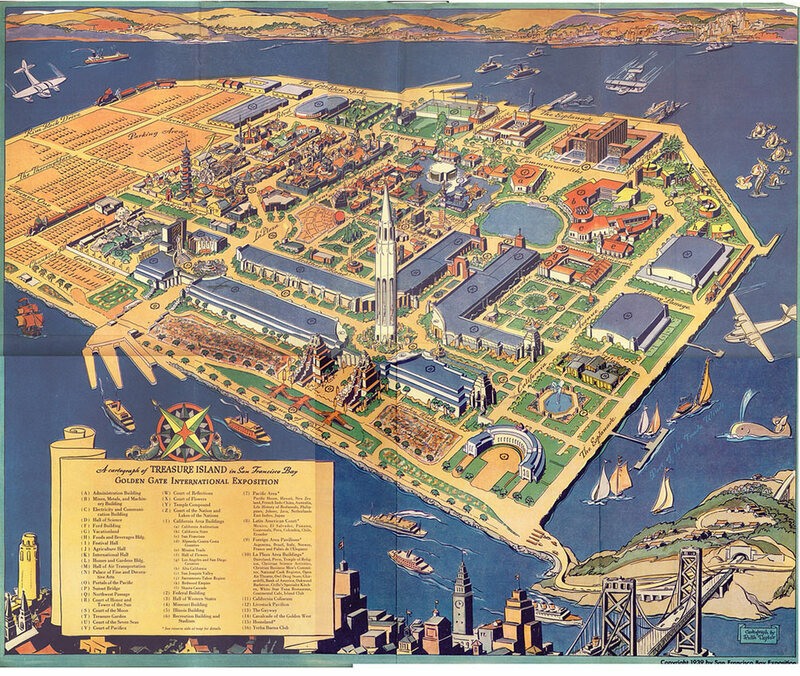 Overview of the 1939-40 San Fransisco Treasure Island Fair were the Mercury was displayed for some time. The car was displayed at the 1939-40 San Francisco World’s Fair, but so far I have not been able to find any photos or movie footage of the car at this event. My guess is that a car like this in 1939-40 must have caused quite a stir. Somebody must know more about it…. 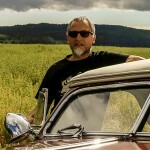 Lets hope this article might lead to some more info about the cars history and whereabouts. Albrecht Goertz, who had worked for three famous designers by 1953, soon set up his own design business. Through his contact network, he got to know Max Hoffmann, BMW’s general importer in America. Hoffmann knew of BMW’s plans to build a big sports car and encouraged Goertz to contact BMW in Munich. Goertz sketched an awesome vehicle and quickly won the bid. In less than 18 months, he designed the BMW 507, the car that celebrated its world premiere in the New York Waldorf-Astoria hotel in 1955. At the same time, Goertz designed an elegant coupe that was also available as a convertible: the BMW 503. This four-seater debuted with the BMW 507 at the 1955 Frankfurt Motor Show, where both automobiles caused a sensation. Even today, the BMW 503 and the BMW 507 are considered absolute dream cars. Sporty, elegant and also cultivated, they represent the core attributes of a BMW car. 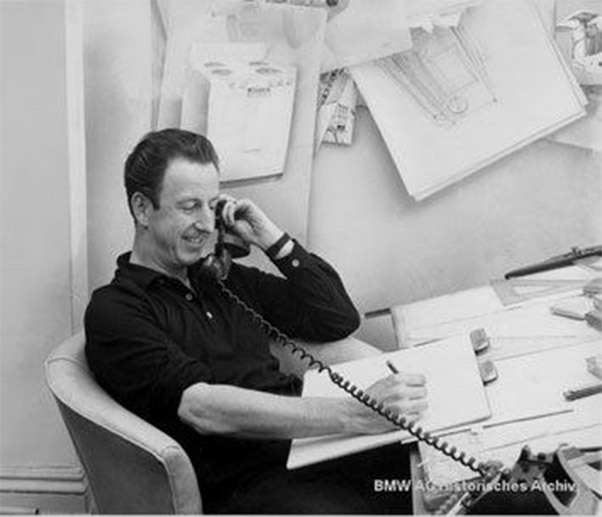 Albrecht Goertz at work at the BMW design department. Special thanks to Keith Griffin for supplying some of the unique images from his fathers collection. Thanks, Rik. Great discovery, from the very early days of “traditional” customizing. The European coachbuilder influence is very strong, isn’t it. After WWII the West Coast customizers crafted their own way forward, and it hasn’t been until much later, the offerings and the GNRS for example, that European styling is again being explored. There are many varied roots to our “traditional” custom car world, aren’t there.